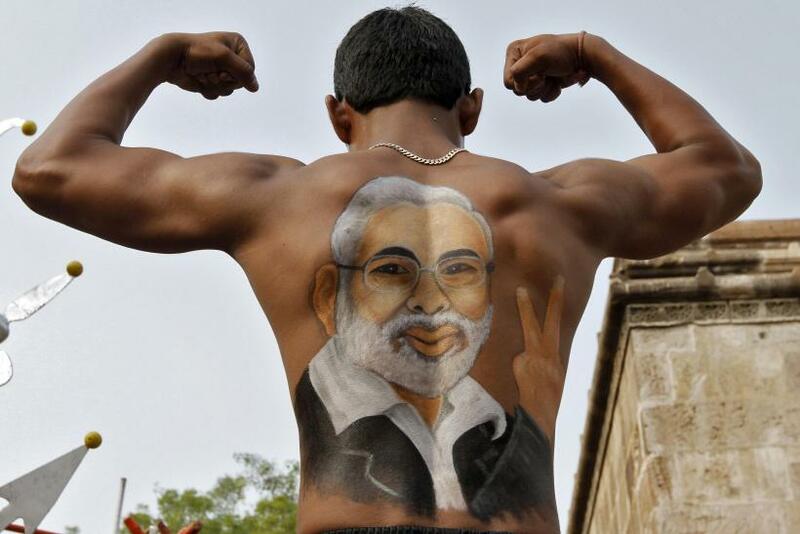 File photo of a devotee showing his back with an image of Gujarat Chief Minister Narendra Modi as he flexes his muscles during the Rath Yatra in Ahmedabad. Prominent economist and Nobel laureate, Amartya Sen, on Thursday, offered to relinquish the Bharat Ratna, India’s highest civilian honor, over a controversy that ensued after he voiced concerns about the prime ministerial ambitions of Narendra Modi, a top right-wing Indian politician and chief minister of the western state of Gujarat. Sen, in an interview with an Indian newspaper, on Tuesday, said that he would not support a prime minister “who generates concern and fear among minorities,” and that he would like a “more secular person” to be prime minister. “I am in favor of someone who looks at social administration and not just business administration seriously. That doesn't mean that I don't see what he has done and why people admire him,” Sen told the Economic Times, on Tuesday. Modi, a polarizing figure in Indian politics, is a senior leader of the Bharatiya Janata Party, or BJP, India’s key opposition party, and has been widely tipped as a leading contender to become prime minister, should the BJP-led coalition win the parliamentary elections slated to be held in 2014. However, he continues to generate criticism, over his administration’s handling of the communal riots of 2002, in which more than 1,000 people were killed in Gujarat -- most of them Muslims -- during his first term as the state's chief minister. Sen said he would not backtrack on his comments on Modi, adding: “Mr Chandan Mitra may not know that the Bharat Ratna was given to me by the BJP-led government and was handed to me by Atal Behari Vajpayee. If Mr Vajpayee wants me to return it, I will certainly return it,” Hindustan Times reported. Mitra, on Friday, expressed regret over his tweet about Sen, adding that he “oversaid” it, but refused to delete the remark. Modi, who has become a popular politician mainly because of his pro-business policies and is credited with the resurgence of Gujarat as a business hub, has been at the center of a number of controversies. Most recently, a letter allegedly signed by 65 Indian lawmakers, in November 2012, and addressed to U.S. President Barack Obama, urging him to uphold Washington’s policy of denying a visa to Modi, has surfaced. The U.S. denied Modi a visa in 2005 over concerns about his role in the 2002 communal riots. In March 2013, his planned keynote address via video conference at the Wharton India Economic Forum of the University of Pennsylvania was canceled after the invitation triggered a strong protest among a section of the college community. Modi continues to reject calls to offer an apology for the 2002 communal riots, saying he has not committed any crimes in connection with the riots, and that he was cleared of any wrongdoing by a Supreme Court-appointed investigation team.